My girls love watermelon. We buy watermelon flavored candy, lip gloss, toothpaste, and drinks! 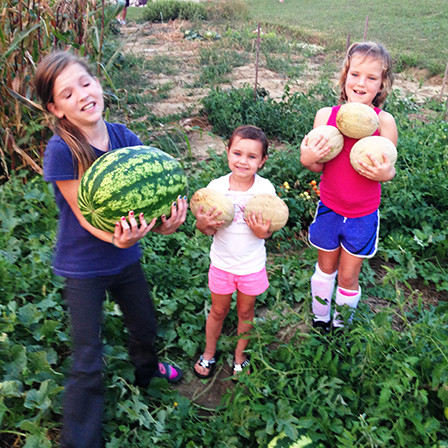 So, of course, our garden has watermelon, too! Watermelon on a hot summer day is an American tradition. It’s a sweet, juicy, sticky, delicious, mess of a treat! The girls planted the seeds and watched the vines grow and grow! Finally, flowers emerged and tiny watermelons began to appear beneath the blooms. 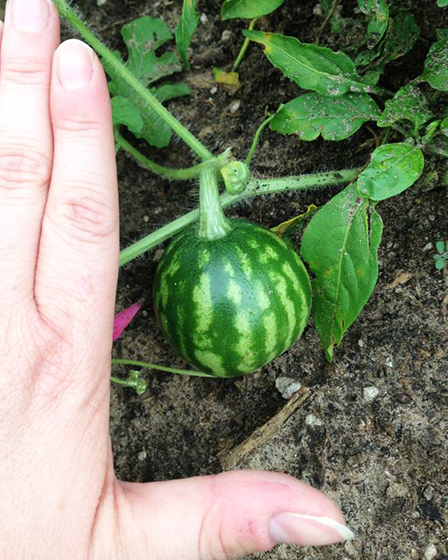 Have you ever seen a baby watermelon? My four year old said, “Oh, it’s so cute!” Watermelon…cute? I wouldn’t call them cute, I would call them delicious! The growing season for watermelon is eighty days. We planted the seeds in late June. We watered regularly and added phosphorus fertilizer once and a nitrogen fertilizer twice to keep the vines healthy. Healthy vines produce larger watermelon. So heavy, that my oldest had a hard time holding it while I snapped a picture. It is hard to know when to pick watermelon. When the eighty days are up, I give the melon a good thumb (does it sound hollow?) and looked at the bottom to see if it is creamy or yellow, not white. All watermelon meeting these criteria get picked and consumed! 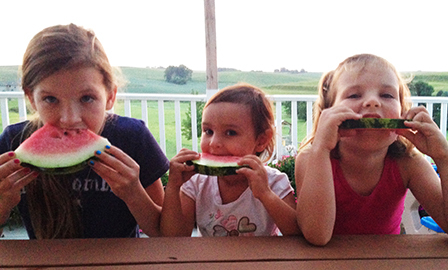 Ripe and delicious according to these three watermelon lovers! I didn’t realize the health benefits of watermelon. You should know that they are more than sweet, they are good for you! Watermelon carries anti-inflammatory and antioxidant health benefits, containing as much lycopene nutrient as tomatoes. 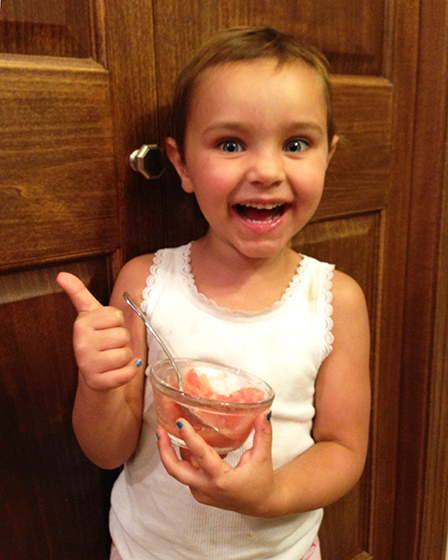 For a different treat we whipped up a watermelon slushy. I cut up the watermelon into cubes, spread them out on a cookie sheet and placed them in the freezer for two hours. Then, I put them in the blender and with a cup of orange juice. We blended it until with was smooth. They were surprisingly good (…my recipes don’t always turn out delicious, but this time it was)! We will definitely grow watermelon again next year. Not just because it’s delicious, but also for the great health benefits for my family who can’t get enough of that sweet, dripping flavor. This should make everyone want to plant watermelon. The kids are precious and the story is educational and entertaining!